"Oh no! My American travel agent has booked me in Metaxourgeio! What can I do?" "I found a great 4 Star hotel for a super low price in a place called Metaxourgeio and my Greek friends say it is dangerous and I should stay somewhere else but I can't cancel my booking. Help!" "I am Sister Priscilla of the Divine Mother of Elvis Middle School and I have three hundred 9th graders and we have booked a hotel in Metaxourgeio. Can you tell me about the neighborhood?" While these quotes are all made up they do represent the kind of questions I get about Metaxourgeio, the area of Athens between Psiri, Omonia and the Larissa Train Station in what is called Central Athens but is actually a little bit off-center. In the past this was a neighborhood that many Greek travel agents would not book their clients, and in fact some of them still won't. 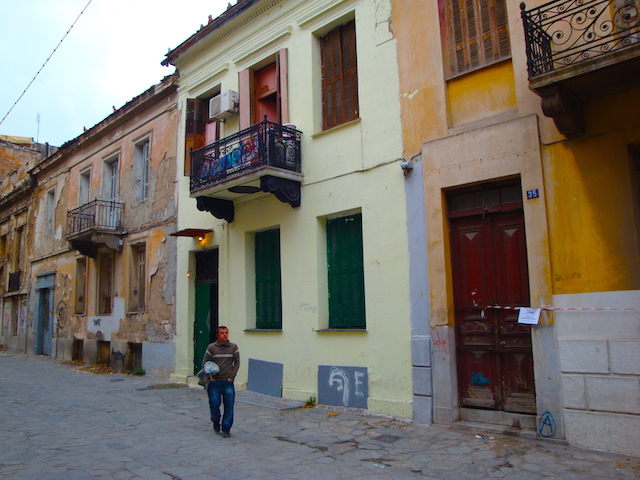 It was an area of illegal aliens and newly arrived immigrants, drug addicts, prostitutes, and struggling businesses, especially the large modern hotels around Karaiskakis Square that had to practically give rooms away to get people to stay there and were getting most of their bookings from discount group package tours, and believe it or not, foreign travel agencies specializing in educational tours for high school students. And while many teenagers would relish the opportunity of staying in a neighborhood with plenty of drugs and hookers, few of their parents would be as enthused. With Athens suddenly becoming a popular tourist destination once again and the most central hotels filling up, more and more people are discovering that their choices of where to stay downtown are limited to areas that in the past they were discouraged from staying at. Metaxourgeio is one of those areas. It is true that I don't actively promote the hotels in Metaxourgeio, for a number of reasons though I would not go so far as to say you should not stay there, especially if you are a young artists who is attracted to areas that are 'up and coming' even if you don't know how far down was and how long it takes to get to up from there. 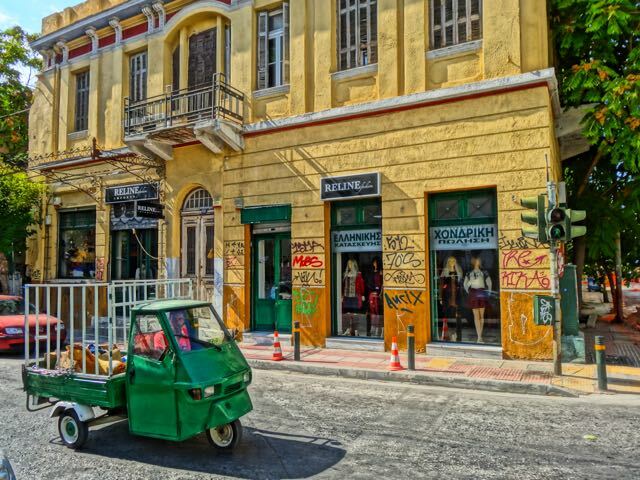 The area has been cleaned up a lot in recent years and even if there are small streets that you should avoid late at night you can say that about any city and even other parts of Athens. These same streets are perfectly safe in the daytime. In fact the whole area has become an area of artists and young visionaries who have taken advantage of the low rents and abandoned buildings to open art galleries, restaurants, cafes, and gardens in some of the empty lots. And much of the neighborhood is just your every day Athens working class class area of apartment buildings and the types of shops and businesses you would find anywhere. Historically the neighborhood of Metaxourgeio has been working class due to the building of a large factory here in the 19th century. 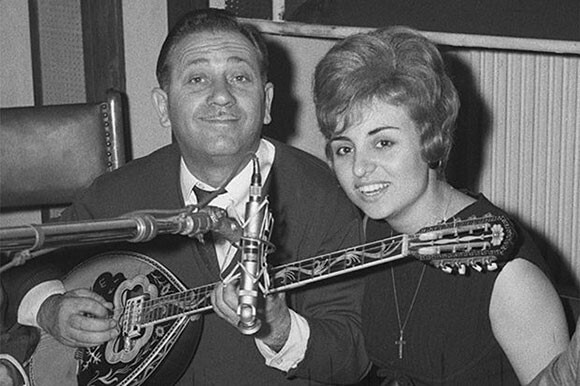 The neighborhood was home to two of my favorite laika/rembetka singers, Vicki Moscholiou and Georgos Zambetas who were both born there as were several other writers, artists and actors, as well as G. Tsakiris the man who introduced potato chips to Greece. If these are not enough to make you want to visit the neighborhood, well let me put it this way: I am assuming Metaxourgeio was not your first choice, or maybe you did not get a choice, you just ended up here because either you did not know what you were doing, or your travel agent didn't. But it is not the end of the world. What Metaxougeio lacks in charm it makes up for in.... well I will think of something. It is pretty uninspiring but that is what makes it interesting. The fact that so many people don't want to be here makes it possible for the people who can't afford to be anywhere else to be here. And among the poor of Athens are the visionaries, artists and people with great ideas but no money. 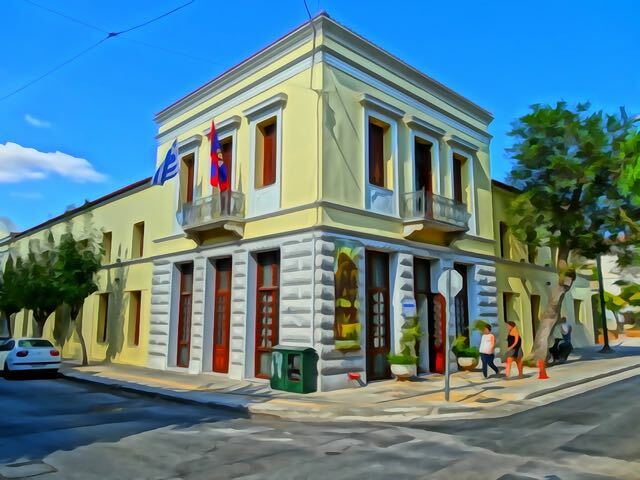 Metaxourgeio is home to several galleries including the Municipal Gallery of Athens at Myllerou 32 and Leonidou on Avdi Square which has a collection of nearly 3,000 works from leading 19th and 20th century Greek artists. Nearby the Rebecca Camhi Gallery is in a neoclassical building at 9 Leonidou Street, and displays a variety of contemporary art forms by Greek and international artisis, including painting, sculpture, photography, film, video, drawing and printmaking. The Breeder Gallery at 45 Iasonos Street represents a group of international and Greek, emerging and established artists has been a pioneer in the development of the contemporary art scene in Athens. Vamiali's Gallery at 1 Samou Street was founded by designer and curator Sofia Vamiali and artist Dimitra Vamiali was the first contemporary art gallery in Metaxourgeio district and includes solo and group exhibitions of emerging and established contemporary international artists. The neighborhood also features a number of small theaters and music venues. Plataion56art is a new alternative space created by artists and managed by painter Anna Theodorakis. The gallery is open to all local and international artists for exhibitions, events and ideas. Contemporary, pop art, British pop, art povera and contemporary interactive sculptures from Germany, Britain and Greece with coffee, free wifi and a piano are an enticement to stop in and meet local artists, exhibit your own art, buy original art at very reasonable prices or just have a coffee and hang out. The gallery is at Plataion 56 just off Achileos Street in Kerameikos. Restaurants in the neighborhood include the traditional Metaxourgeio Taverna at Leonidou 46 which first opened in 1936 and is known for its generous portions of traditional Greek dishes. To Avgo tou Kokora (The Egg of the Rooster) relocated here from my neighborhood of Kypseli into a building that had been a taverna since before the Second World War and has managed to bring its clientele along with it, politicians, artists, journalists and businessmen, and serves traditional Greek food with the best local ingredients. The Tamarind Restaurant on trendy Avdi Square is Athens' first authentic Thai restaurant. Also on the square is The Λα Μπυράζ at 31 Leonidou street, a lively cafe-bar which has swing dancing every Thursday night. For Americans who long for the Golden Age of the Republican Party you will be happy to know there is a place for you at Nixon at 61b Agisilaou Street. It is a combination restaurant/bar/cinema with walls full of Richard Nixon paraphernalia. Right next door is Belefonte, a classy bar and disco in an old industrial building. The Breeder Feeder is a cafe attached to the Breeder Gallery at 6 Perdika Street is an organic restaurant that only opens Tuesday, Thursday and Friday after 9 pm. Call 210-331-7527 for reservations because you will probably need one. Aleria at Meg.Alexandrou 57 in a renovated neo-classical building, has been featured in newspapers and magazines as one of the most innovative and professionally run restaurants in Athens, serving Greek and Mediterranean cuisine paired with excellent wines. El Convento Del Arte at Virginias Benaki 7 is a combination theater, gallery, restaurant and wine bar. Metaxourgeio is also the home to what is becoming the Chinatown of Athens and there are a number of small restaurants that are frequented mostly, if not only, by Asians. 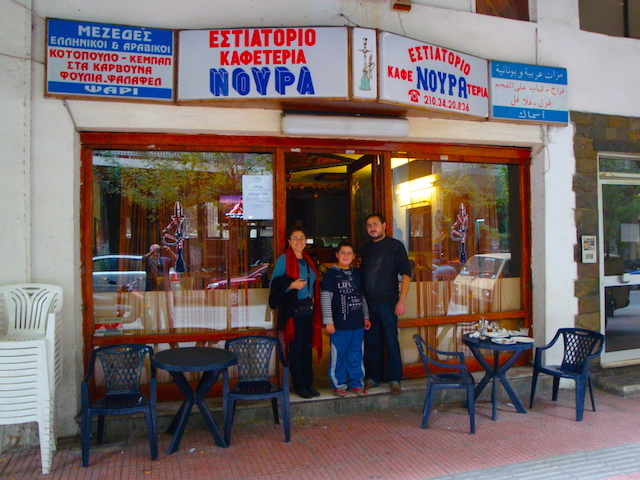 One of the best Middle Eastern restaurants in Athens is the family owned Om Kalthoum, which was formerly called Noyra at 85 Megalou Alexandrou Street and has delicious food and live music some nights. You can get to Avdi Square which is the center of the resurgent Metaxourgeio by walking from Platia Kariaskakis down Deligiorgi street and turning right on Leonidou or Keramikou Streets and walking about 5 blocks. You can also get there by going from Kariaskakis down Achilleos Street and turning left on Millerou Street. If you are coming down Pireos-Tsaldari Street from Omonia Square turn right on Millerou. Because restaurants, bars and cafes come and go in Greece's struggling economy it is possible that a particular restaurant or bar may no longer exist by the time you get there. But you can be fairly certain that something else will have popped up to take its place. It is not buzzing with activity in the daytime though there are a few cafes and restaurants open and have tables and chairs in the square. In the evening it is much more lively. My friend tells me the square is a popular gay hangout and it is a few blocks from The Apartment, one of the biggest and best gay clubs in Athens at 76 Kolonou Street, just off Karaiskakis Square. You can walk safely on every street in the daytime no matter how threatening it may look. 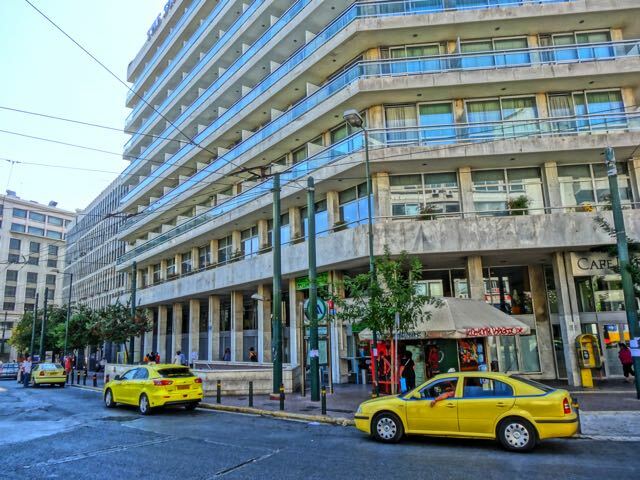 For those staying in the hotels on Karaiskakis Square walking on the large avenues in your journeys to and from the historic center may be the way to go if you are the nervous type. 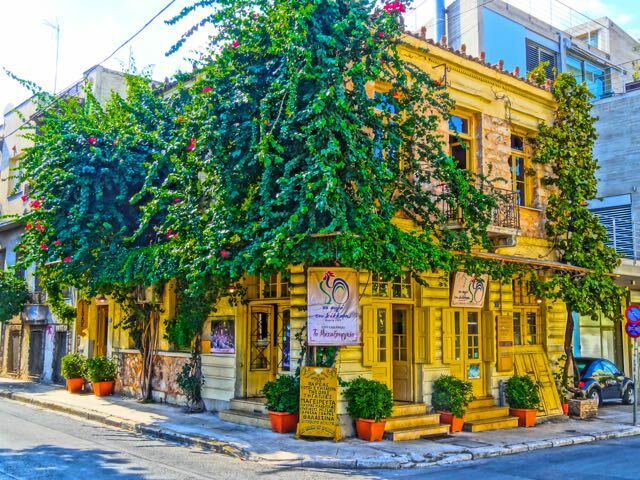 Walk up Agios Konstantinos Avenue a few blocks and you are at Omonia and you can walk right down Athinas Street and be in Monastiraki and the Plaka and the whole trip will take you about half an hour. 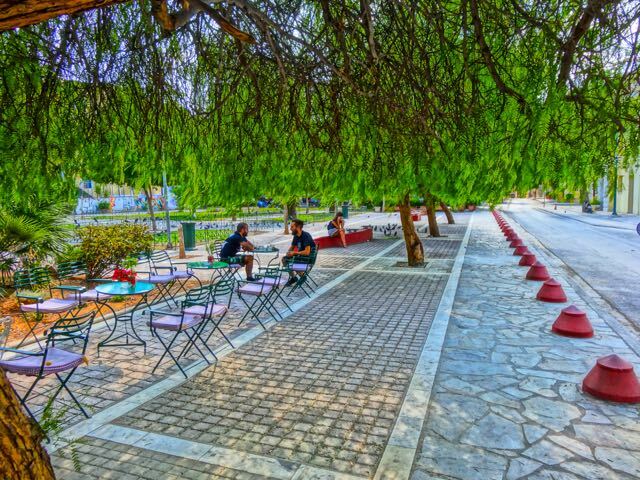 Or walk up Deligiorgi Street (not to be confused with Theodorou Deligiani Street) take a right on Pireos Street and a left at Platia Komondourou, (or Platia Eleftheria, in English: Freedom Square) and you will find yourself among the cafés and restaurants of Psiri. Or if you just continue down Pireos you will find yourself in Gazi, the former gasworks of Athens, another popular nightlife area right across the street from the Archaeological site of Kerameikos. If you turn left on what looks like a park but is actually the bottom of Ermou Street you can walk all the way to Syntagma, passing Monastiraki on the way as well as the pedestrian road that will take you through Thission and right to the Acropolis, the Acropolis Musem and the Temple of Olympian Zeus. Of course you can also just take the metro from the Metaxourgeio Station at Platia Kariaskakis right to Syntagma Square or keep going to the Acropolis Museum station and begin your exploration of Athens from there. If you want to take the metro to Monastiraki, Thission (close to the entrance of the Acropolis) or to catch your ferry to the islands from Pireaus, you change at Omonia Square and look for the signs pointing to Pireaus. To get to the airport from Metaxourgeio change at Syntagma. Also from Syntagma you can take the tram to the beaches of coastal Athens. The metro stations of Athens all have themes and Metaxourgeio is no exception. 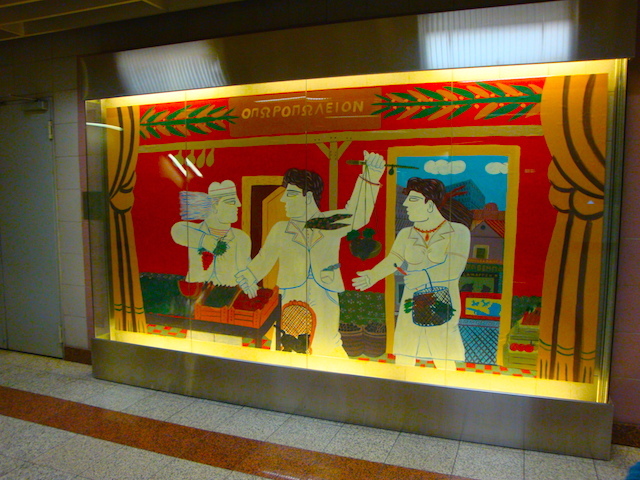 The theme for the Metaxourgeio metro station is the Greek artist Fasianos whose work can be seen everywhere once you recognize his style, which is very unique. From Karaiskakis Square down Theodorou Diligianni is an area of smaller, inexpensive to very cheap hotels around the Larissa Train Station which is where the trains to and from Northern Greece are. This is also the area where the buses to and from Albania and many of the Balkan and Eastern European countries are located. Therefore it is a hub for immigrants coming and going from Athens and these are the people who these hotels cater to. That does not mean that tourists don't stay here. Some do. Those looking to stay in Athens as cheaply as possible may find bargains here. 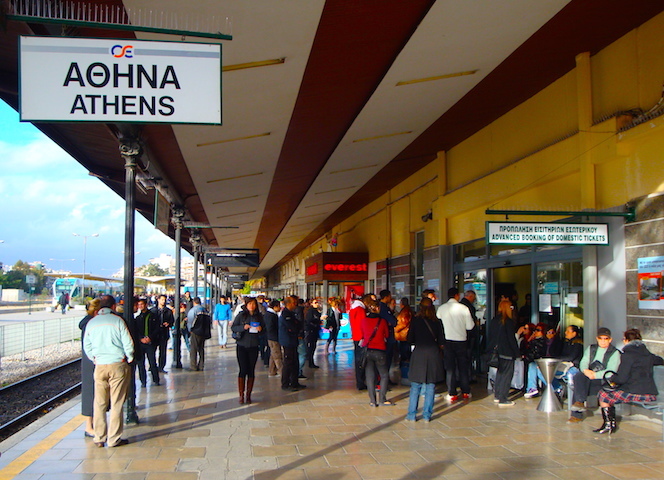 And since Larissa Station is also a metro station as well as a stop for the Proastiakos, the suburban railway that connects the airport to Pireaus and goes all the way to and beyond Corinth, for someone staying one night who just wants to visit the Acropolis and move on while spending as little money as possible could do so by staying here. Personally, I might do it though I would not stay down here with my family. Whether you stay in a nice hotel on Karaiskakis Square or one of the small cheap hotels in Metaxourgeio and you are coming home late from downtown after the metro closes I do suggest taking a taxi right to your hotel. Chances are if you walk, especially in a group that includes a couple big strong dudes, you will be fine. But why risk it when a taxi will cost you from 3 to 5 euros and you are probably saving at least ten times that amount by staying in Metaxourgeio. Besides that this is an economic crisis and taxi drivers barely make a living so you should support them. And as for Sister Priscilla of the Divine Mother of Elvis Middle School... Do yourself and your fellow chaperones and the kids a favor and stay somewhere else closer to the center, even if it costs a little more. Not because it is unsafe. No down and out and desperate person is going to attempt to rob one hundred middle school students. It is just not worth the hassle. But because Metaxourgeio is so far from the historical center of Athens all your students will hate you for making them walk so far. Or else take the money you saved by staying there and rent a bus. 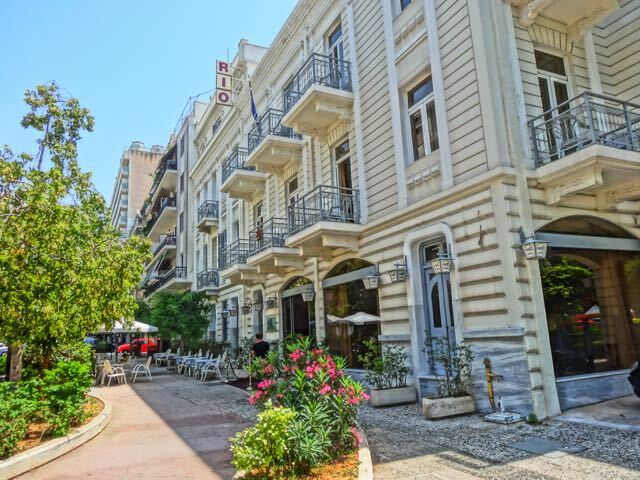 The highest rated hotel in Metaxourgeio is the 4-star boutique Athens Lotus Hotel located right off Karaiskakis Square and the metro station, in a beautiful old neo-classic building. They must have spent millions restoring this hotel because it is a work of art. Affiliated with the hotel is the Athens Lotus Apartments and the White Lotus Hotel, both with equally high ratings from those who have stayed there. Right on the square is the Hotel Stanley, a large, modern hotel with a swimming pool, 2 restaurants and 3 bars. The rooftop Virtus Restaurant serves fresh fish and features Acropolis and Lycabettus Hill views. This is the kind of hotel you could come back to from sightseeing and never leave. The Crystal City Hotel is also on the square and is also a large modern hotel with a rooftop restaurant with amazing views of the city. The 4-star Hotel Novus offers soundproof rooms with flat-screen TV, free private parking, a rooftop pool and bar with excellent city views and across the street the 3-star Hotel Minoa has comfortable rooms and a helpful staff. The 3-star Hotel Rio Athens is in a restored neo-classical building next to the Hotel Stanley, right on the square. The 3-Star Dorian Inn is on Pireos Street and is closer to Omonia Square than Kariaskakis and an easier walk to Psiri and downtown. It also has a rooftop pool and a restaurant 13 floors above the city which is high for Athens. Also close to Omonia is the 3-star Athens Mirabello. 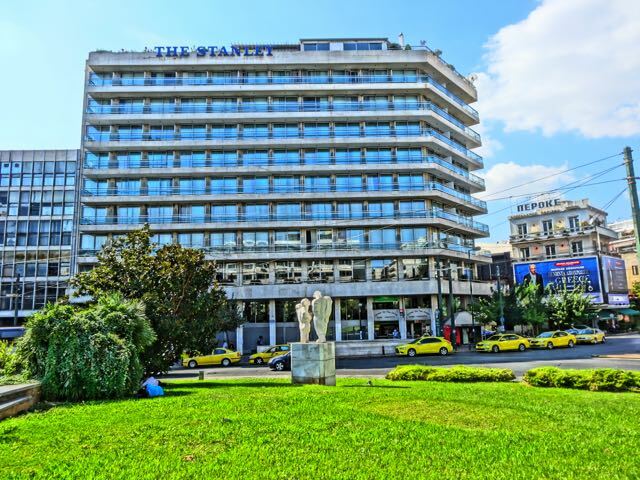 The 3-star Best Western Pythagorian is halfway between Kariaskaki Square and Omonia Square. For the more economically minded the Hotel Cosmos has simply furnished rooms with balconies and Free Wifi (almost all the hotels have balconies and free Wifi). Otherwise there are bargains to be found at the Athens Delta Hotel as well as the 3-star Athens Oscar Hotel right by the Larissa Train Station.